Since Sunday was St Patrick’s day, naturally I had to do an Irish recipe. The annoying thing is that Irish food is very meat-heavy. And while I have an number of recipes for vegetarian versions of Irish meat recipes, I really wasn’t in the mood for improvisational cooking – too exhausted. School plus job hunting has made me very busy this month and very tired, hence the lack of posts. So I decided on a different stereotypical Irish food – Irish Soda Bread. I went to my go to online recipe site, allrecipes.com and found a really simple recipe. Honestly, easier than making chocolate chip cookies, which I mastered by age 7. Measure the dry ingredients into a bowl, mix. Then add the wet ingredients and mix it all together. Like most dough, once it starts coming together it is far more efficient to mix with your hands, rather than a spoon. Seriously, always finish mixing dough with your hands. Always. 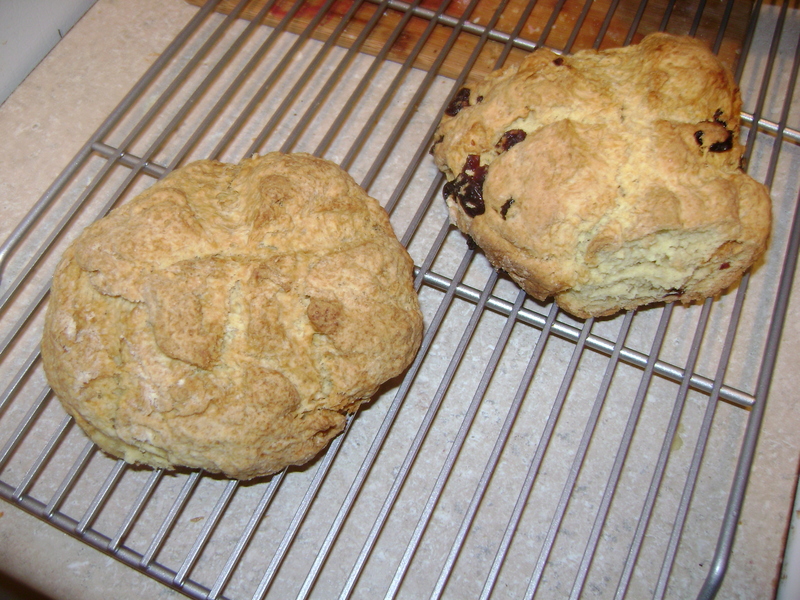 Most commercially sold Irish Soda Bread has raisins. But I’m not really a fan of raisins. I don’t dislike them, but I am not about to buy them while I’m on a tight budget. I do, however, love dried cranberries. So I made two smaller loaves, one plain and one with the cranberries. As always, bake until it smells good. The soda bread turned out pretty well. Its very very crumbly, especially as it gets older (I made it Sunday, but I’ve been eating it as my breakfast toast for several days). It can get a little dry too. The solution to that is honey! I never really ate honey growing up but one of my best friends absolutely loves it, and she converted me. But I didn’t break down and buy some for myself til this weekend (I’d been thinking about it, but never really got around to it). Soda bread, spread with butter and honey, with a nice cup of tea … more proof that simple things are often wonderful.